Moral Fibres, a sustainable living blog from the UK (the spelling of fibre vs. fiber was the giveaway), has a review of two environmental books for kids. Wendy read How Does My Garden Grow? by Gerda Muller and The Tomtes of Hilltop Stream by Brenda Tyler. These books are from a Scottish publisher, so they may be difficult to find in this country. But every now and then I like to make an attempt to recognize that the U.S. isn't the only place on the planet that publishes books. 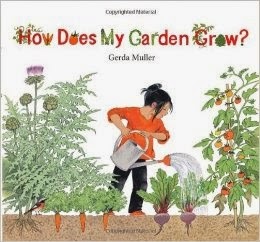 I'm fond of little kid garden books. Try Amazon UK The UK site has all my books from US publishers, so it stands to reason that both will have your authors - or some of them. Ooh, these books are gorgeous - and indeed, the UK has been pretty good about environmental books for older readers. I really like the picture books, too, though. Thanks for linking to me! Another good book is The Journey Home by Frann preston-Gannon: http://www.amazon.com/The-Journey-Home-Frann-Preston-Gannon/dp/1843652099/ref=sr_1_4?ie=UTF8&qid=1401001003&sr=8-4&keywords=frann+preston+gannon it should be easier to find in the US!